WASHINGTON — Lockheed Martin has proposed doing additional maintenance work on F-22s in the hopes of lengthening the life of the fighter's low observable coating. Under the current contract, Lockheed is charged with refurbishing the low observable (LO) coating on the inlets of 10 F-22s per year at its facility in Marietta, Georgia, while the U.S. Air Force recoats F-22 inlets at the base in Ogden, Utah, using its own organic maintainer staff. However, the company believes it can get a head start on work planned for 2019, when the leading edges of the aircraft will need to be recoated, with a number of near-term modifications to keep the existing coating in good shape, John Cottam, the company's F-22 deputy program manager told Defense News. 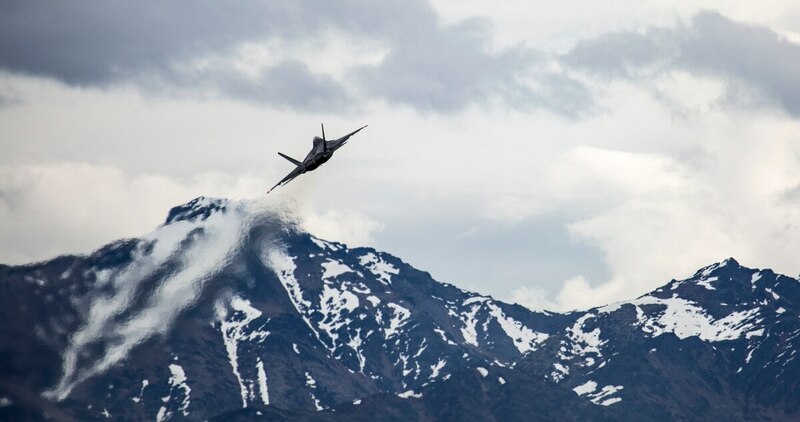 Lockheed submitted its proposal for additional F-22 work in late April and is awaiting a decision from the U.S. Air Force on whether to move forward with any of the suggested work. One of the modifications involves applying a product called Mighty Tough Boot to the aircraft, which fills gaps on the surface of an F-22 that could cause the aircraft to be seen on radar, Cottam said. "The gaps on an airplane are what raises the signature of an airplane, so by putting these coatings or these gap fillers into the airplane, you're helping the low observability of the airplane," he said. "It reduces the amount of corners and things that are picked up by radar." From 2014 to 2016, the F-22's mission capable rate has fallen from almost 73 percent to 60 percent. One contributing factor is the breakdown of the Raptor's stealth coating, Col. Michael Lawrence, chief of the maintenance division in the Air Force's directorate of logistics, said in a March interview with Defense News' sister publication Air Force Times. "Across the entire F-22 fleet, we’re experiencing low observable coating reversion problems. Basically, in high flow areas, what’s essentially happening is there’s a gradual deterioration of the coatings," he said. "If the LO coatings aren’t doing what we need them to do, then the platform loses its ability to do its primary mission, which is get behind enemy lines without detection." However, Lockheed and the U.S. Air Force had always expected the LO coating to gradually degrade, and it is doing so on pace with the company’s predictions, Cottam said. He likened the LO coating deterioration to a painted fence post that is exposed to the elements. "If you leave it out in the sun long enough, eventually that paint is going to crack, and if you don’t do anything to fix it when it cracks, eventually it’s going to start to peel off in chunks," he said. "In this case we knew it was going to occur about this time in the aircraft’s life, [and] we are starting to see the coatings on the airplane start to wrinkle and crack just like you would the paint." A stealth jet’s inlets are the most critical part of the plane to recoat because, if the LO coating begins flaking off, it could be ingested by the engine, causing permanent damage. "When we do these fixes to the inlets, and we will continue this as we do the edges, we’re actually using a different compound than we had used on the production airplanes, which has significantly stronger, lasts much longer, so it’s going to be giving the Air Force a longer time in the next interval where this might become a problem," Cottam said. Although both the F-22 and F-35 incorporate low observable technologies, the composition of the LO coatings are completely different and require separate application processes. "We would very much like to go towards, as best we can, the way the F-35 coats their airplanes for a number of reasons," he said. A single or more similar coating would lower material costs, enable the Air Force to train one set of maintainers to sustain the coating and simplify the inventory. "If we could get closer to something common, it would be a great savings. We’re trying to work that. Our engineers are very busy trying to see where that is possible." Air Force Times reporter Stephen Losey contributed to this article.